Get Rs.30 off on Jio recharge of Rs.303 or more & Rs.150 Cashback on movie tickets. Promocode is valid only for limited period. 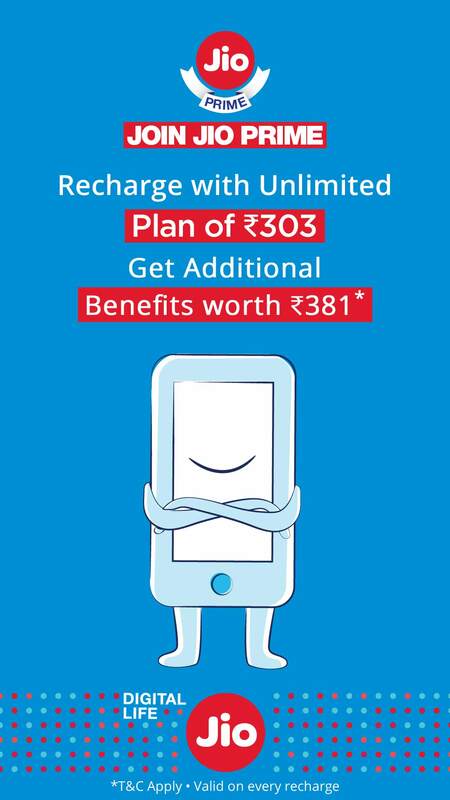 * Get Rs.30 off on Jio recharge of Rs.303 or more & Rs.150 Cashback on movie tickets. * Promocode can be used twice per user in March & April 2017. * Promocode is valid only on Jio Mobile recharge. * Use code MOVIE4JIO to book movie tickets after 24 hours of successful transaction. * MOVIE4JIO will be valid only on booking of at least 2 movie tickets on Paytm. * Maximum Cashback on movie tickets is Rs.150. * Maximum discount on Jio recharge is Rs.30 per transaction. * MOVIE4JIO can be used only once per user for each recharge. * Cashback to be credited within 24 hours of successful movie tickets booking on Paytm. * The movie Cashback to be availed within 30 days. * Paytm reserves its absolute right to withdraw and/or alter any of the terms & conditions of the offer at any time without prior notice.